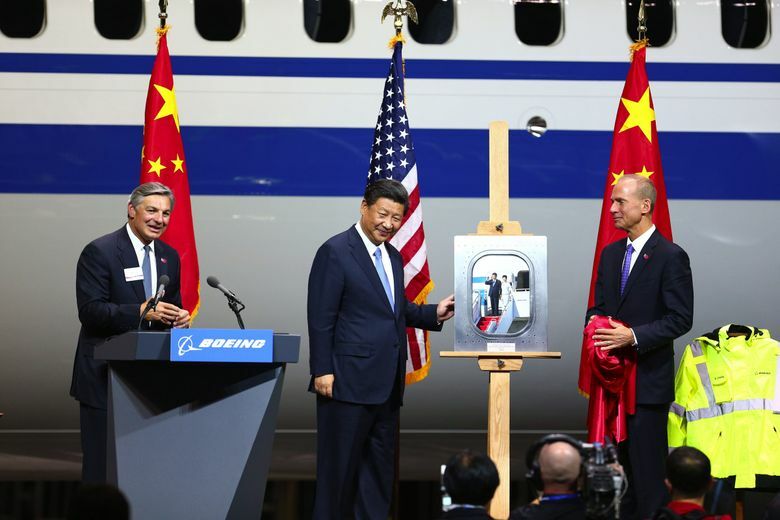 When Boeing Chief Executive Dennis Muilenburg introduced Chinese President Xi Jinping before about 600 Boeing workers and Chinese airline guests in Everett on Wednesday, he trumpeted the good news of orders and commitments from China for 300 jets. 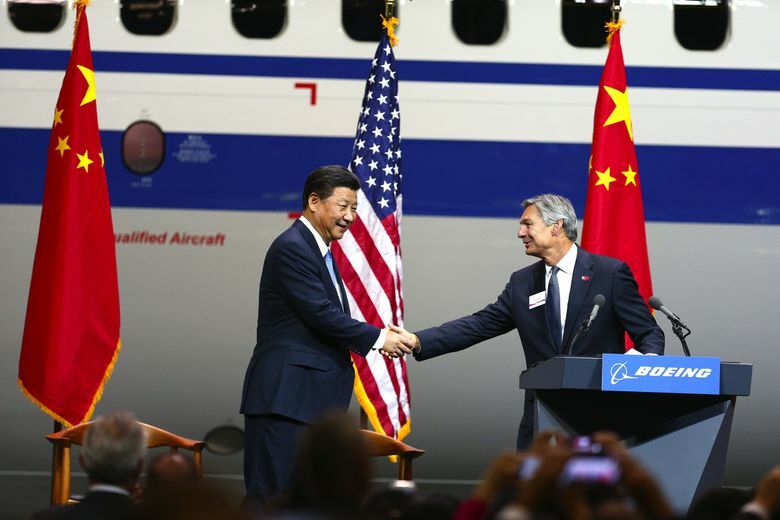 The more contentious news — that Boeing had signed deals to put a 737 jet-completion and delivery center in China and to move more parts work there — was not mentioned from the stage. The 737 completion work — installing interiors, and then painting and delivering the planes — is done today in Renton and at Boeing Field, and advance reports of the deal prompted the Machinists union to organize protests outside the company’s plants Wednesday. 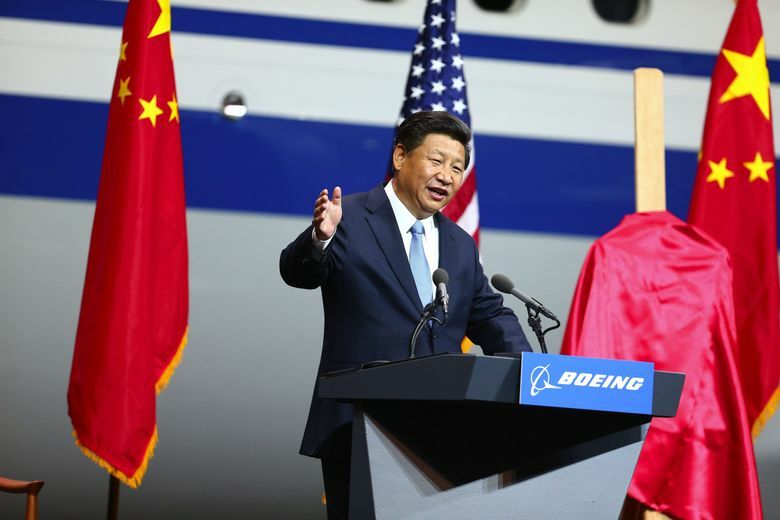 Boeing and China’s state-owned jet maker Commercial Aircraft Corporation of China (COMAC) will jointly operate the new completion center at a yet-to-be-decided location, Boeing confirmed after Xi spoke. 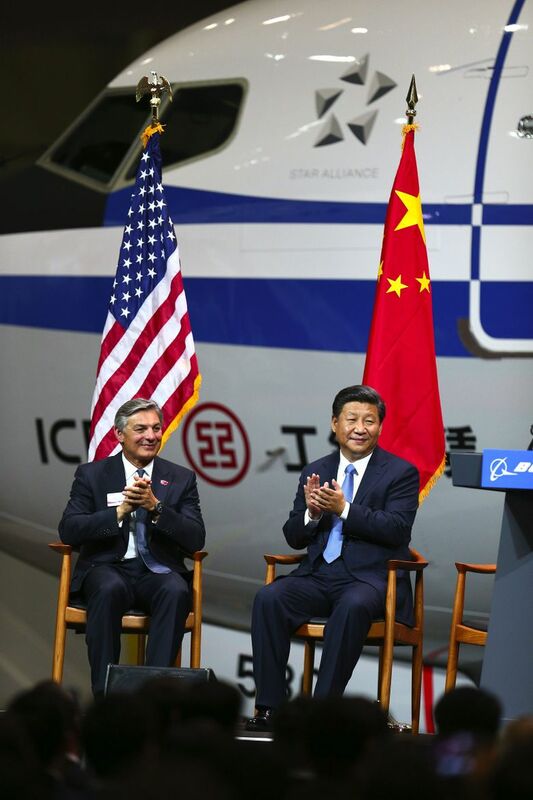 Boeing also announced a separate agreement to give “major component and assembly-work packages” to Chinese parts maker Aviation Industry Corp. of China (AVIC). Boeing spokeswoman Jessica Kowal said the specifics of that deal have not been decided. Machinists in the audience grappled with the implications of the China deals. Steve Hunt, 60, an inspector on 747 final assembly and a veteran with almost 30 years at Boeing, grimaced when asked about the work going to China. If the completion center to be established helps build Boeing’s market share, that “could become a catalyst to growing the business even more” and could lead to more jobs here, not fewer, Conner said. He said the steep increases in production already planned at the Renton assembly plant — from 42 jets per month today to 52 per month in 2018 — are driven in large part by sales to China. Bette German, 57, a Machinist who installs electrical wiring on the 767 and has worked at Boeing for 10 years, said as she waited for Xi that she’s hopeful the China deal will deliver on that expectation. “I never like to see the work go somewhere else,” said German. “But it seems Renton has a lot to do without that work.” She paused. “I’m hoping,” she added. 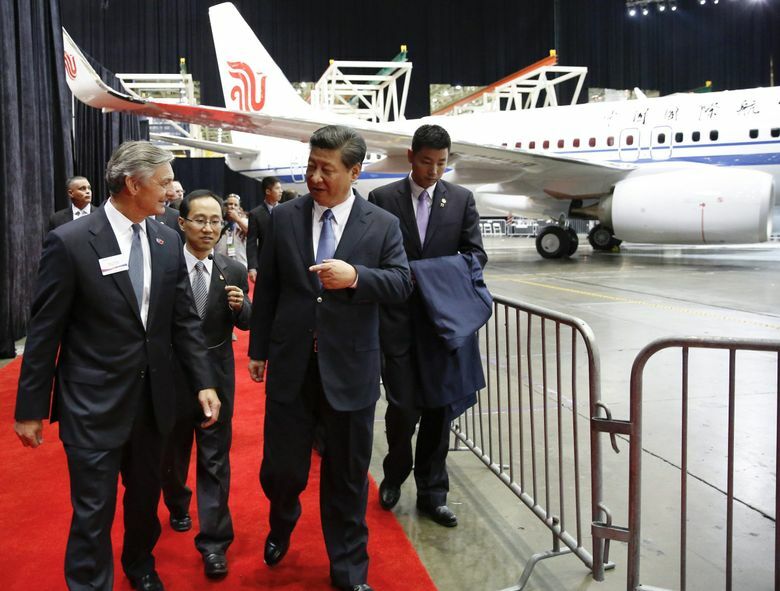 Xi, who addressed the Everett crowd with an Air China 737 and a Xiamen Air 787 as his backdrop, was on the second day of a 48-hour visit to the region, with additional stops Wednesday at Microsoft and at Tacoma’s Lincoln High School. He leaves Thursday morning from Paine Field, and heads to Washington, D.C., and New York. 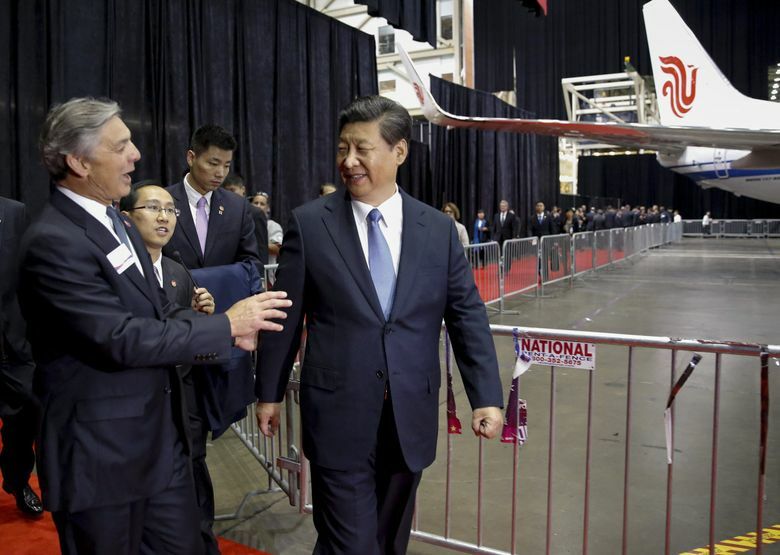 China has taken delivery of about 1,500 Boeing airplanes, more than any other country outside the U.S. 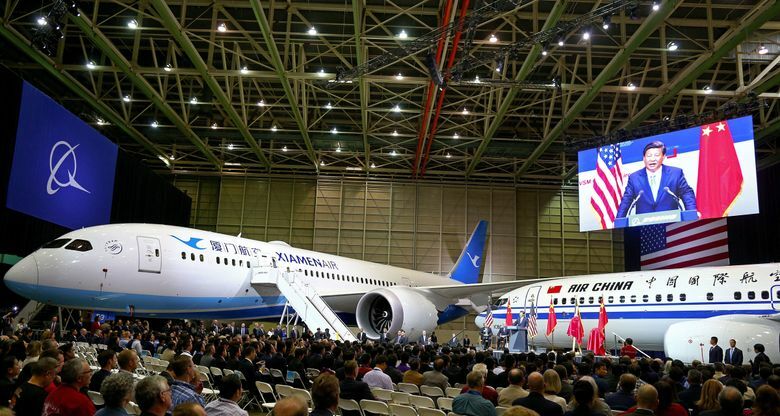 Currently, China takes a quarter of all Boeing jets delivered and nearly a third of all the single-aisle 737s. The orders and commitments for 250 single-aisle 737s and 50 widebody jets announced Wednesday carry a list price of about $38 billion. After standard industry discounts, the actual value is typically about half that. 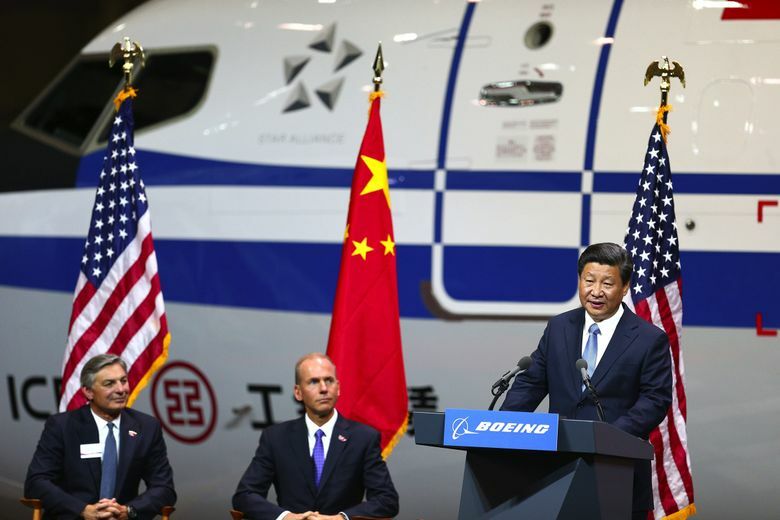 Boeing officials said without giving details that some are not new orders, but previously booked sales only now being identified as from China. The rest are new commitments that should be finalized in coming months. Technically, it’s a violation of the Agreement on Trade in Civil Aircraft — a side agreement among many member countries of the World Trade Organization (WTO) — for a country to require placement of work in return for jet sales. All the Western countries, including the U.S., are signatories to that agreement. While China has only “observer status” on the agreement, as a WTO member it cannot openly flaunt violations of what is a basic tenet of free trade. Conner said there’s no direct trade of work going to China in exchange for sales. “It’s strategic for us,” he said. “They have not linked sales directly to this, but we anticipate that there will be sales that will come. … To be competitive in that marketplace, it’s important we become part of the fabric of their industry. Angling for more of that pie, Airbus already has an A320 jet final-assembly line in Tianjin, China, and has committed to locate an A330 completion center there, too. Conner’s assurances on local jobs failed to pacify Machinists union leader Jon Holden, whose members do most of the work that is being sent to China. The International Association of Machinists (IAM) District 751 president said his members have worked hard to introduce the efficiencies that made Renton the most productive airplane assembly plant on the planet. Holden cited the $8.7 billion in tax breaks that the state granted Boeing in 2013 in return for agreeing to build the 777X here. In between honks of support from passing traffic outside the Renton plant, District 751 Local F unit President Robley Evans said further work will inevitably flow to China as a result of the 737 finishing center. 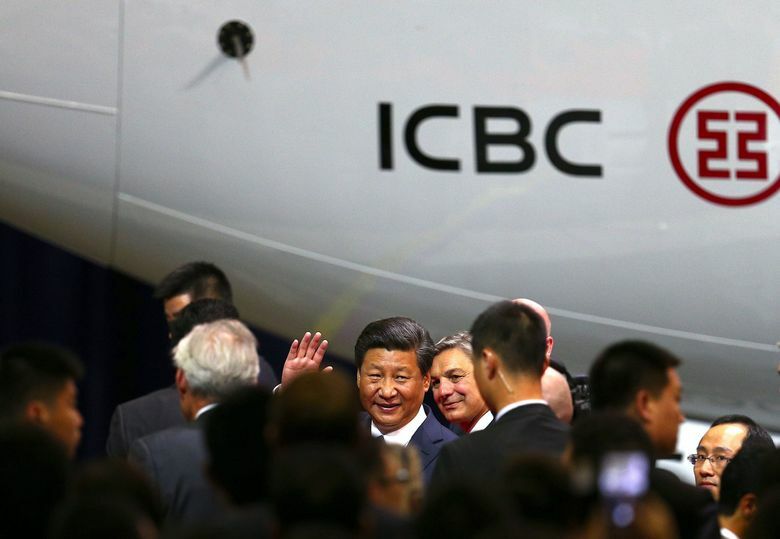 COMAC is developing a competitor jet to the 737 called the C919. Holden said the union will closely examine Boeing’s plan in light of this contractual obligation along with the legislative obligations that came with the tax breaks. Longtime aviation analyst Adam Pilarski of consulting firm Avitas was also dubious of Conner’s assurances. “It doesn’t sound like a very likely outcome,” said Pilarski. 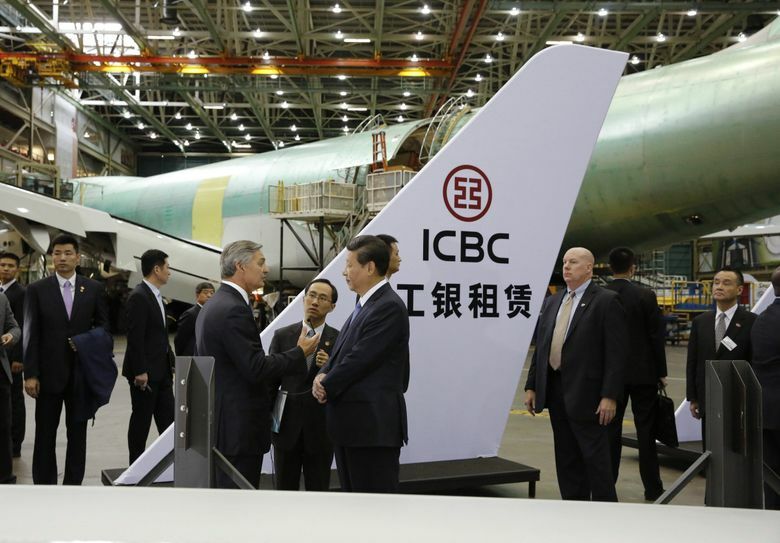 In July, Boeing Chairman Jim McNerney talked about moving work overseas after Congress failed to reauthorize the U.S. Export-Import Bank, which guarantees billions of dollars in financing for Boeing’s foreign-jet sales. Though Conner said in the interview that the China deal is not a reaction to the politics of the Ex-Im freeze, Pilarski suspects a link. 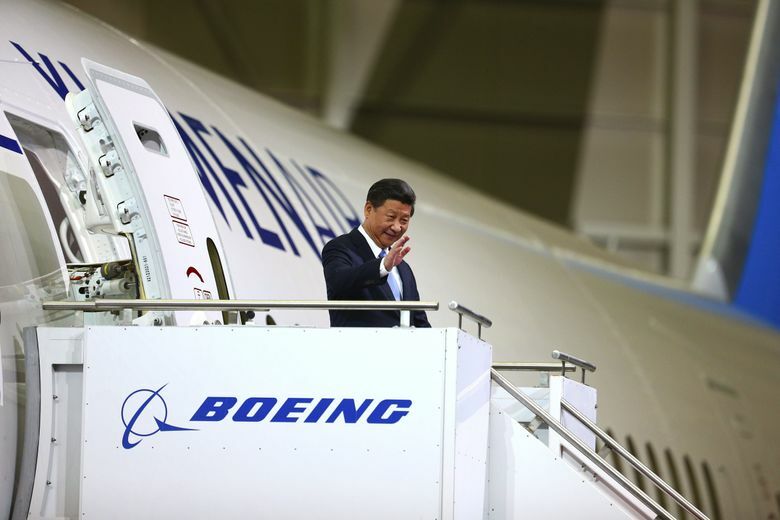 Still, he said, this China deal could have a strong impact on the politics of the Ex-Im issue. Yet Richard Aboulafia of the Teal Group, another respected industry analyst, characterized the deal with China as relatively small potatoes. 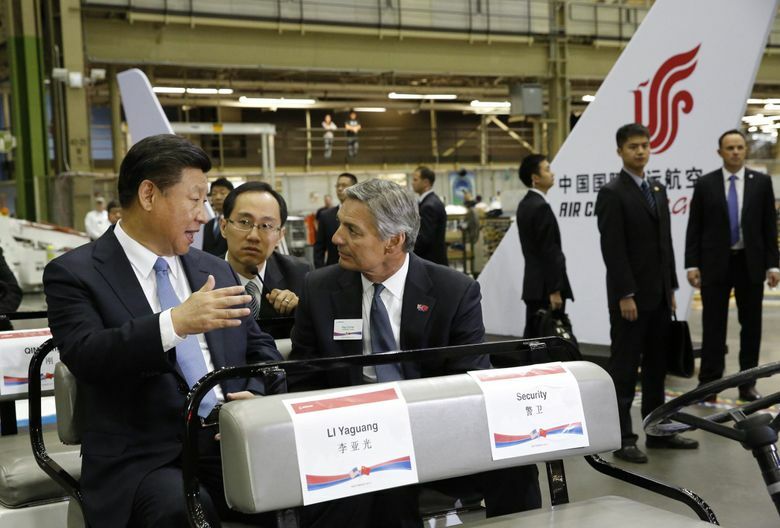 “Compared to the work given to, say, Japan or Italy — the wings and tail of the 787 — this is a tiny package,” Aboulafia said. “It’s really tough to get worked up about the risk here,” Aboulafia added. He said such strengthening of economic ties between the two countries “is a kind of insurance” that current political tensions and superpower maneuvering — the concern over China’s actions in the South China Sea or its cyberhacking — never break out into a major military crisis. 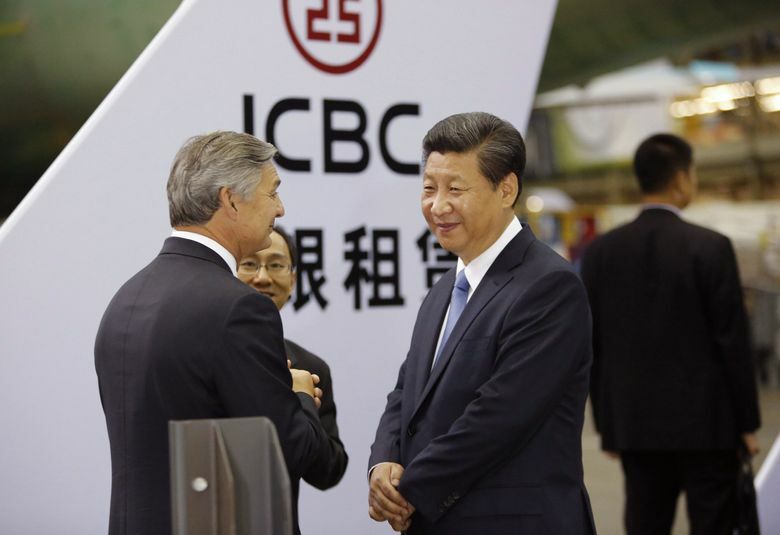 “The more we have these intense economic relations, the better,” Kapp said. “We try to stay away from the political element of this and stay focused on what’s in the best interests of our stakeholders. … and let the government-to-government relationships continue to work themselves out,” he said. Dominic Gates: 206-464-2963 or dgates@seattletimes.comStaff reporter Coral Garnick contributed to this report.